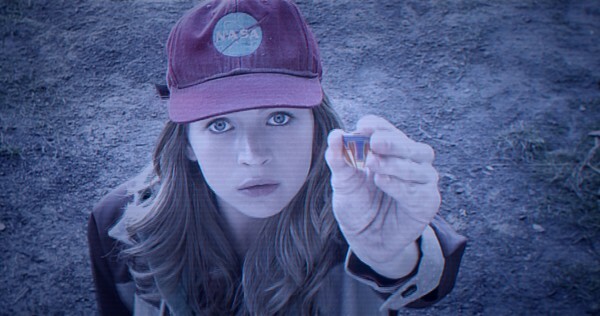 “Tomorrowland” will be labeled as Brad Bird’s first bust and a box-office disappointment for all involved. For the record, I don’t agree with that at all. Both Bird and Disney will live on and maybe this movie will be appreciated more in the future, ironically. While I understand the issues many will have with the movie Bird directed – and co-wrote with Damon Lindelof and Jeff Jensen – I have a hard time heaping vitriol on a movie that champions imagination and hope. Yes, it’s a heavy-handed in delivering its often conflicting messages and plot points, but it nevertheless takes its audience on a fantastically crafted journey, one that is rarely seen anymore on the big-screen. The reason why may be subtly, or not so subtly, explained within the movie and I’m sure people will take issue with that as well. At its best, “Tomorrowland” is an excellent gateway to get kids interested in sci-fi, NASA and the possibilities of great hearts and minds crafting a better tomorrow (since “Meet the Robinsons” didn’t take off for Disney) – that is, if we don’t get in the way of ourselves. At its worst, it’s a movie that drives these points (and many others) ad nauseum, especially during the last third of the story, which is full of explanations and attempts to answer all your questions while leaving you with more unanswered ones. 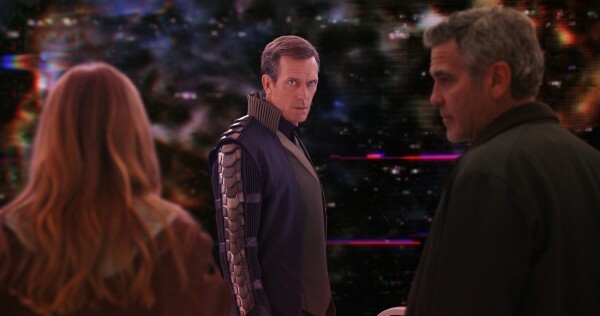 The movie opens with the grizzled, unshaven image of Frank Walker (George Clooney), as he attempts to record a video explaining his involvement in Tomorrowland and the state of the modern world. He becomes a bit of a downer as he explains how messed up the world is and is interrupted by teenager Casey Newton (Britt Robertson), a more optimistic yin to his curmudgeonly yang. From here, the story goes on to tell us how these two met, providing us with a bit of backstory and motivation for these two characters. In 1946, at the Wold’s Fair in New York City, young and optimistic Frank Walker (Thomas Robinson) is excited to submit his homemade jetpack rocket into san inventor’s competition. He is excited and super smart, yet is rejected by inventor, David Nix (Hugh Laurie), when it’s revealed that the pack enable its user with the power of flight. However, Frank’s enthusiasm and determination captures the eye of a young girl named Athena (wonderfully cast Raffey Cassidy), an assistant to Nix. She gives the boy a pin with a the letter “T” on it, which transports him to Tomorrowland, a futuristic utopia with monorails, flying cars and jetpacks (that actually work). Frank finds Athena and the two of them develop a friendship that will have long-lasting ramifications. The story then fast-forwards to modern-day Cape Canaveral, where we meet Casey Newton (Britt Robertson), an optimistic teenager, whose father (Tim McGraw) is about to lose his NASA engineering job due to budget cuts. She happens upon a mysterious “T” pin and is shocked to discover that touching it transports her to a futuristic city. Unfortunately, a timer on the pin shortens her visit, but her little brother, Nate (Pierce Gagnon “Looper”) hops online and finds an address in Houston linked to the pin. Unbeknownst to her father, Casey takes a bus to track down the address, which is a pop culture sci-fi memorabilia shop run by Ursula (Kathryn Hahn) and Hugo (Keegan-Michael Key) – which is where things start to get really weird for Casey. Next thing she knows, Casey is in a stolen vehicle being driven by Athena, who is still the same age we saw her in the scenes with young Frank. 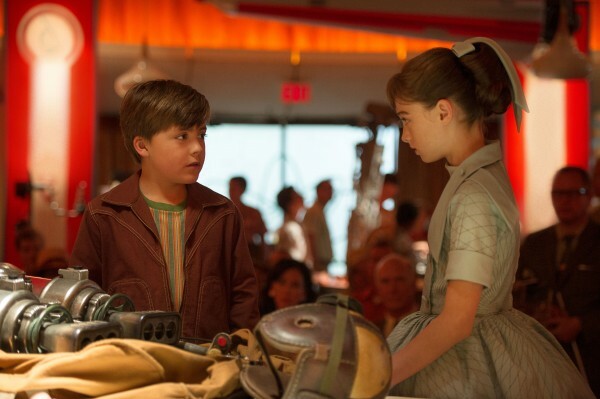 Athena tells Casey she is “special” and that they must drive to New York and find Frank Walker, convinced that between the two of them, they can find what needs fixed in Tomorrowland. They meet a crotchety Frank, who isn’t surprised to see Athena, which is when we learn he was exiled from Tomorrowland 40 years ago. 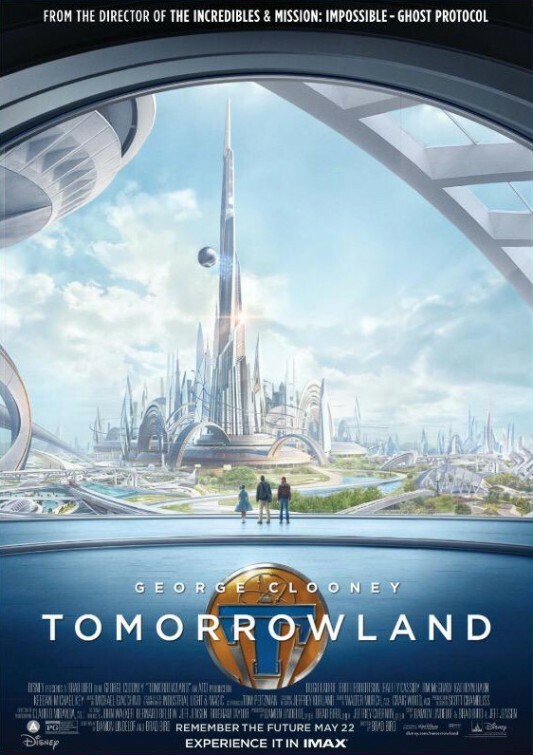 Reluctant at first, Frank sees in Casey the hope and wonder he once had and agrees to fashion a way to get back to Tomorrowland in an effort to prevent the world from certain doom. That’s just the first two acts of an action-heavy (from the man who helmed “Mission: Impossible – Ghost Protocol”) storyline, where quite a bit is thrown at us and if we wind up questioning what is happening along the way, we’ll be left behind. Bird and his co-screenwriters want us to just go with it, which is really the best way to get an enjoyable experience out of “Tomorrowland”. In many ways, it is definitely like the live-action Disney films of the 60s, which had children as protagonists in a plot founded in some kind of sci-fi quirk. Honestly, it’s a challenge for Bird’s ambitious film to find its footing with an audience that feels like they’ve either seen it all or have access to it all on their tablet. It’s best bet is for the movie to tap into a demographic age group of say, 8-12 years, a group that can not only relate to characters their own age on-screen, but hopefully will tap into the possibilities that come with hope and imagination. If that seems somewhat saccharine, so be it. “Tomorrowland” looks at that future from today’s cynical world, where the media focuses 24/7 on natural disasters, environmental deterioration and political issues that overwhelm the ideas that could prevent the world’s demise. The movie may be hitting some of us over the head with issues we’re already aware of, but think of the viewpoint of a certain age group that doesn’t have the years of living many of us do. Instead of the doomsday information we’re used to, the movie chooses to end on notes of optimism that will be hard for some to swallow. With his impressive filmography, any new film by writer/director Bird should be received with great anticipation. “The Iron Giant” and “The Incredibles” included a retro look at sci-fi, making Bird a perfect candidate to helm a film that takes a retro look at the future. Having always enjoyed the possible future that exists in the Tomorrowland section of Disney World and its futuristic counterpart, E.P.C.O.T., I was certainly looking forward to Bird’s take on it all. Bird has fun with the tone and feel of the picture and includes a handful of Easter Eggs for those steeped in Disney history and sci-fi pop culture – he even manages to include Jule Verne, Gustave Eiffel, Nikolas Tesla and Thomas Edison (with a bit of himself), in the film. The problems come from the screenplay though, specifically the convoluted aforementioned third act, which finds the movie suddenly explaining everything. It’s almost as if Bird, Lindelof and Jensen (who’s spent years as an Entertainment Weekly film reviewer) got carried away with their first two acts and realized they had a lot of explaining and answering to get to. They wind up dumping it all into the last part of the film which takes place in an underwhelming Tomorrowland, now resembling an abandoned theme park. I want to blame Lindelof, who is known for producing ambitious screenplays with fantastic ideas that are often littered with confounding questions. He often leaves those dangling questions unanswered, like his work on ABC’s “Lost” and often has characters behaving uncharacteristically, like in Ridley Scott’s “Prometheus”. The screenplay here is especially odd with the way it attempts to criticize those who embrace an apocalyptic view of the future, in either video game or movie form. That was both an unsuccessful and unnecessary way in which to somehow guilt the audience into being optimistic. We can easily arrive there on their own, thank you. Just lead us there and we’ll come up with our own conclusions. With three other screenwriters here, we can’t target all of this movie’s problems on Lindelof. Bird is our tour guide in this sweeping and often invigorating story. 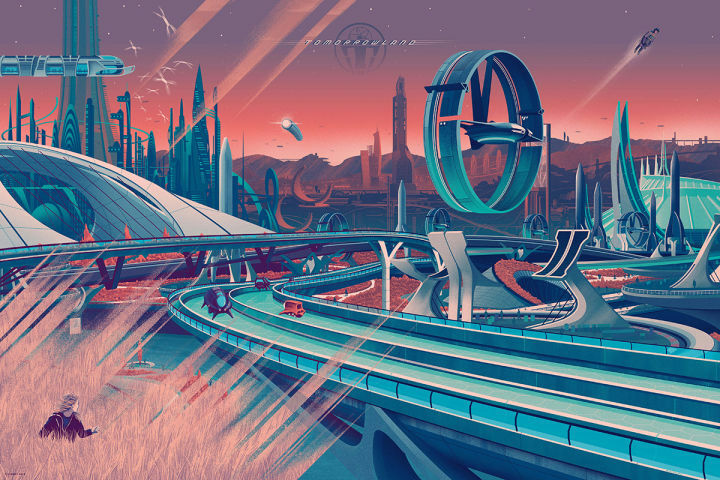 I understand some of the criticism “Tomorrowland” will receive, but I chose to appreciate it for what it is trying to be and especially for what it is definitely not – a sequel, prequel, remake or reboot. For a movie based on a Disney theme park ride, it has more heart and earnestness in it then all of the “Pirates of the Caribbean” movies combined. There’s a lot about “Tomorrowland” I haven’t included here. It’s best you discover it all on your own. I’ve learned over the years, that my job as a reviewer isn’t to explain away the movie. My responsibility is to inform and express my own experience and perspective, which is kind of what Bird and company are doing here. In fact, most of the time, I see myself as much of a guide as a director. Consider this review your “T” pin. I’ll lead you to the film and then you make up your mind from there.